If Godzilla remains a cautionary tale about the perils of nuclear power, miner Cameco may be one for investing in the uranium industry. Its decision to withdraw its application to build and operate its Millennium underground uranium mine in Saskatchewan because of poor economic conditions in the uranium market shows that betting on an industry pure play remains a risky venture. Japan reversing its ban on nuclear power following the Fukushima reactor meltdown. The hope that Germany would revisit its phase out of nuclear power by 2021, as coal remains a dirty word. Russian hegemony in the Ukraine creating instability in the gas market. The completion last year of the U.S. and Russia's "megatons to megawatts" program that converted old nuclear warheads into fuel for reactors, effectively removing a large supply from the market. 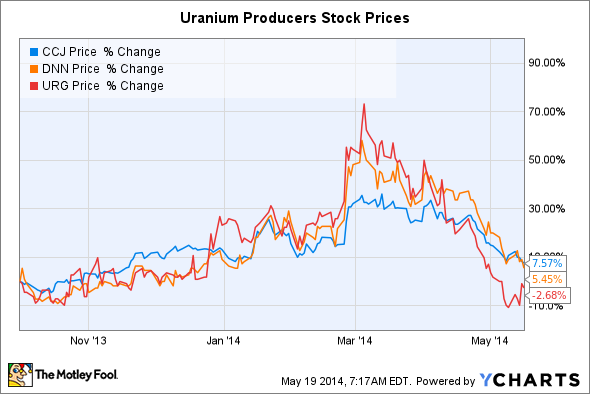 Shares of uranium stocks enjoyed a run-up late last year on the belief that 2014 would jump-start a recovery. Between mid-October and mid-March, Cameco saw its shares appreciate some 50% in value. Additional upside for investors in the uranium miner came last December in the form of Saskatchewan's provincial government approving the environmental impact assessment at Millennium, concluding that, so long as Cameco adhered to its plan, the harm to fish, wildlife, and water it caused would be minimal and could be reversed once the site was decommissioned. The underground Millennium mine is estimated to contain in excess of 50 million pounds, or 20,000 tons, of uranium. Cameco already owned a 42% stake in the project before acquiring an additional 28% from Areva in 2012 for $150 million. One of the main attractions of Millennium was that it wouldn't have any mills or long-term waste management facilities at the site. The radioactive material produced at the mine would be sent to the nearby Key Lake mine for processing. Yet, the promise of substantial gains didn't hold up as uranium pricing continued to fall. Japan, after all, has delayed restarting its nuclear reactors. Germany hasn't made any movement to reverse its policies, and the uranium supply glut remains in place. Uranium prices hit eight-year lows, sliding to $29 a pound at the start of May, or levels not seen since 2005. They're down 16% so far in 2014 alone. In such an environment, Cameco was forced to postpone the hearing scheduled for next month before the Canadian Nuclear Safety Commission. It informed the commission that, due to current economic conditions, it didn't want to proceed with licensing, though the agency said that, should the miner change its mind in the future, a new hearing would be rescheduled. Millennium was one of three projects under evaluation for further advancement, and was one of the keys for replenishing its deposits as the reserves at its active sites are depleted. Unlike other miners with diversified streams of revenue, Cameco is a very risky investment in a declining market such as it's currently experiencing because it is wholly dependent on uranium for sustenance. Kazakhstan is the world's largest producer of uranium, accounting for 38% of the world's production last year, up from 28% in 2009 when it surpassed Canada for the top spot. The country holds 12% of the world's uranium resources, and produced about 22,550 tonnes in 2013. Cameco has a 60% stake in a joint venture at Inkai that is operated with the Kazakhstan government-owned Kazatomprom. Inkai is one of three material uranium deposits the miner has; the other two are the Smith Ranch and Highland, in Wyoming, and Crow Butte in Nebraska, both of which are 100% owned by Cameco. Given the weak current outlook, and Cameco's own stated guidance to not push production growth as aggressively as it has in the past, the delay at Millennium suggests shares of the miner could emerge as ravaged as if the kaiju and the MUTO had waged battle all across it. Investors seeking exposure to uranium might be better served by seeking out one of the more diversified miners in the industry. Imagine a company that rents a very specific and valuable piece of machinery for $41,000... per hour. (That's almost as much as the average American makes in a year!) And Warren Buffett is so confident in this company's can't-live-without-it business model, he just loaded up on 8.8 million shares. An exclusive, brand-new Motley Fool report details this company that already has over 50% market share. Just click HERE to discover more about this industry-leading stock... and join Buffett in his quest for a veritable landslide of profits! The article Not Even Godzilla Can Save This Uranium Stock originally appeared on Fool.com.